We are so excited about the return of the inimitable space game, Marc Miller's Triplanetary! On Kickstarter January 15, we'll deliver on Steve Jackson's promise to release a new edition of this long-awaited classic, and to prepare, we have video for you . . .
Triplanetary, first released in 1973, depicts ship-to-ship space combat using a vector movement system. You can race across the solar system, patrol to stop the pirate menace, defend humanity from alien invaders, and more! Steve has been a fan of this game since college and maintains that Triplanetary is one of the best space games ever created. We agree! 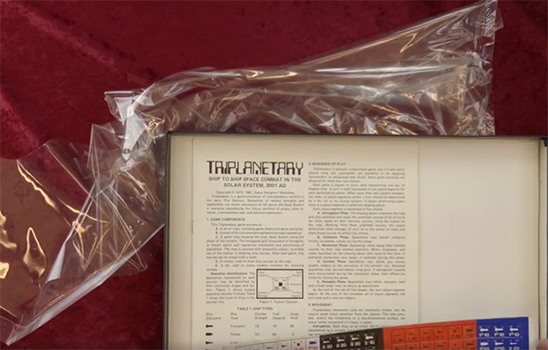 Steve has a perfectly preserved Triplanetary copy in his office that we've been itching to take a look at. Well, we finally stopped resisting and unboxed it on #SJGamesLive. Those of you who have a well-loved copy of the game can revel in Triplanetary in all its glory, while new fans have the opportunity to see a small slice of history from the dawn of the hobby. Check out our Facebook page, and journey through the past, and the stars, with Steve Jackson!